First Man, the story of Neil Armstrong’s successful moon landing, is both a technical triumph and a deeply personal portrait of a couple. The degree of your enthusiasm for it will probably be determined by your interest in the subject itself. If you have no interest in the moon landing you may feel lukewarm because the film is focused entirely on the people and the feat. 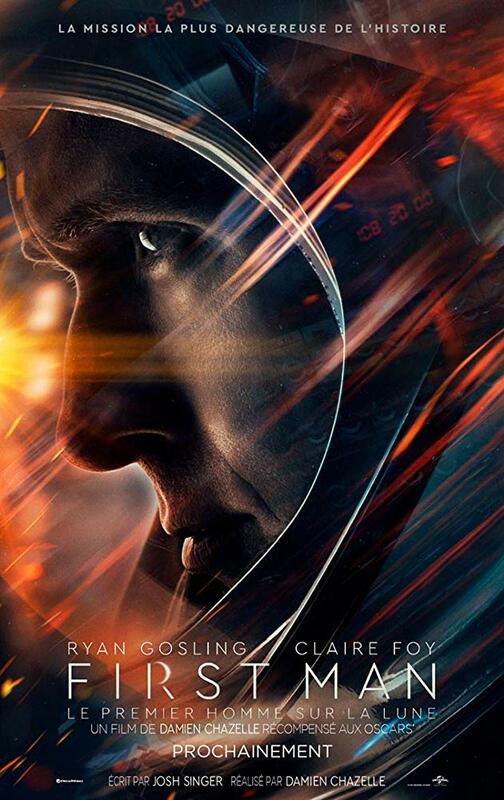 Credit for the quality goes to Ryan Gosling who creates a quiet, serious Neil Armstrong and to Claire Foy who plays his wife Jan in a way that you won’t forget. Gosling and Foy deliver the intensity of the life Armstrong has won in deep competition with other astronauts who wanted the job. An unprecedented mission wraps the couple in the deep pressures and the dangers that accompany it. Both these actors generate the power that comes from failed moon shots in the past. The only precedents they have are the deaths of the astronauts who have died while trying. We are awash in the reality of the personal danger and the justification for spending the money that was spent between 1961 and 1969. Is the spending really justified? Was the enormous amount of money spent in order that the Russians not be the first nation to plant a flag on the moon? Have Americans really been told what has been accomplished since Armstrong’s successful trip? With all the problems facing our country – education, medical, economic, decaying infrastructure – was it really wise to spend so much to plant a flag on the moon? Assuming your answer is yes, you may well love watching this beautifully made movie. It unfolds to a brutally loud score that emphasizes everything that happening on screen. Watching Armstrong pilot the capsule through space as he is nearly killed by vibration and noise is unforgettable, no question. It’s so bad that the question roars: why did he want to do this? As the soundtrack overwhelms us, we begin to explore the reality of piloting that capsule through the layers of space with no room at all for even a simple mistake. Claire Foy makes Jan a loyal but often angry wife who says once, “I married Neil because I wanted a normal life” and then forces him to have what may be a last conversation with his son. Both Foy and Gosling create two intelligent people who love their family and face the possibility of losing it all. When the movie is in space, the sound is deafening. When it is on Neil and Jan, the silence and the confrontations are acted with extraordinary skill by Claire Foy and Ryan Gosling. They are awash in unprecedented emotions and they convey their fear with quiet, powerful talent. No one in history has ever had their experience. As we watch two endangered lives unfolding, we are physically overwhelmed by the relentless sound and danger of the capsule. The humanity is delivered quietly by two intelligent actors. This review was posted on October 7, 2018, in Biography, Drama, History/Biography. Bookmark the permalink.